Have you planned your New Year’s celebration yet? A little short on cash? Consider giving a last minute shout out to friends and acquaintances --The more random the better. Those that accept, have them pair up to provide a course of the meal. 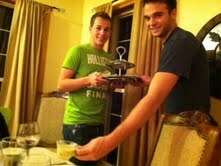 Each take turns serving, with one pair volunteering to do dishes. What you have is a gourmet evening with good company for the cost of making one dish at home. The entree to our last impromptu gathering this week was a hit (Chef Daniel Boulud's Pork Shoulder with Guinness, Dried Cherries, and Sweet Potatoes). All in all, it makes for a very frugal – very fun evening out. 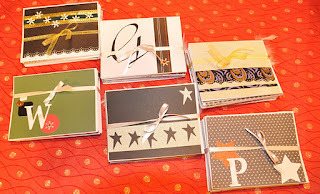 Hope you are gearing up to enjoy wrapping up 2011. During the gifting season, it is sometimes difficult to find the ‘perfect’ present. Some of the best are those from the heart. 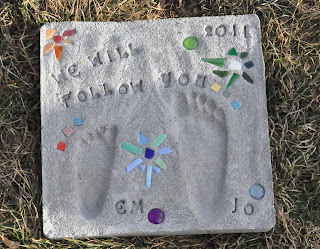 Like the garden stone with our grandchildren’s’ foot prints, framed photos of special moments from the past year, lovely scarves from faraway places we have traveled. Sometimes the best gift can be the offer to undertake a dreaded task, like cleaning out and reorganizing a storage room or offering your services as dishwasher for your parent’s dinner party. The very best gift is the present of presence, being there for one another, either in person or in heart. And to think – it doesn't cost a penny. How grand. Every year, in place of buying gifts for one another, we take a family vacation for Christmas. This year was an exception. The year got away from us. With no extra funds set aside for travel, we decided to spend time together at home. To compensate for not traveling, we exchanged gifts with one another. We made many of the gifts, but we still felt like we needed to buy everybody something. This was way more work than we remembered. Spending money in such a short window of time for so many people, and not knowing if it is something they would like, need or want --is stressful. As we rush around getting last minute gifts, we should also be mindful of the end of the year for tax reasons. Here are a few items to check off your list before 2012 rolls around. 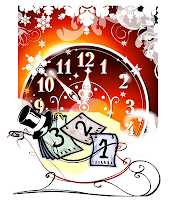 - Last Minute Charitable Contributions: Time to get in the last minute charitable contributions for the 2011 tax year. Is it time to clean out your closet and make a donation to Good Will? Can you afford to give a little extra to a charitable cause? It has been a rough few years for a lot of people and your donation may be just what your favorite charity needs to help those in need. - Unreimbursed Medical and Dependent Care Accounts: These are your "use it or lose it" accounts. You have to use the money by the end of the year or you forfeit your balance. If you have money in these accounts, maybe it is time to get your eyes checked or a new pair of glasses. Make sure you have paid all of your dependent care expense and that your balance is zero. It is the holidays and in the spirit of gifting and the joy of creating, make useful and fun things for family and friends this time a year. Tis the art of Upcycle: To make new from items that have lost their usefulness or value. Everyone has a little elf inside them. Get out the glue and glitter and release your inner elf. Very fun. Very frugal. Higher tuition, more student loans, and greater access to higher education…what do we do? The Occupy Wall Streeters (OWS) say they are not going to repay student loans and are demonstrating on college and university campuses.In today’s Inside Higher Ed daily updates, there is an article about how their energy might be misplaced.This article argues that college and university administrator’s hands are tied because states are cutting funding to higher education and students are demanding quality student services and education.They are feeling that their only or best choice is to raise tuition and fees, which ultimately increases the debt burden for college graduates. “Frugal Fun”', “Holidays”: The two topics go hand-in-hand. So much of the joy of the holidays is the time spent with love ones and surprising them with something special. The something special does not have to cost a mint. Gifts from the heart can be the least expensive and the most treasured. 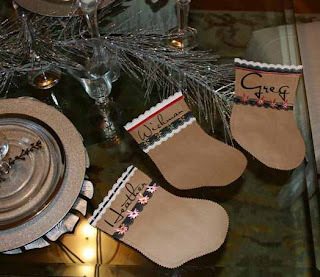 Frugal-festive examples from our homestead this year include packets of homemade monogrammed stationary: Stockings made from a fabric stash and old costume jewelry: And grandparents teaming up with the grandchildren to make extra special surprises for the parents. These activities make the holiday glow -- from the joy of the planning, the making and the giving. 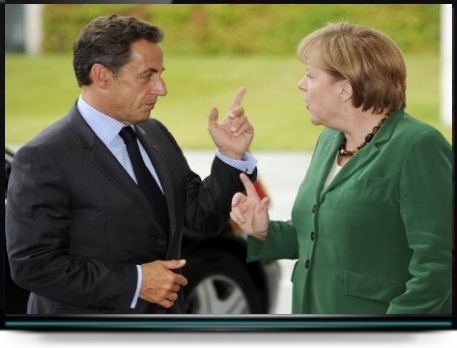 Zone Euro: Sarkozy et Merkel dans le viseur des agences! L'agence de notation américaine Standard and Poor's l'affirmait depuis de longues semaines, "la faiblesse du processus de prise de décision dans l'Union européenne et la zone euro" et le "manque d'avancées des dirigeants européens pour éviter la contagion de la crise" mettaient clairement "en péril la note actuelle de nombreux états..."
Zone Euro: Sarkozy ...pour un dernier tango avec Angela? 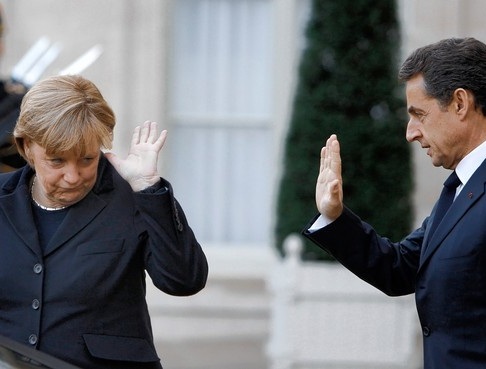 Une semaine bien lourde... La Zone euro reste suspendue au prochain tango, celui d'un président français et cette chancelière allemande, "Une Angela Merkel qui serait toujours plus droite dans ses bottes..."
What happened to your debts when you die? As seniors increase their debt during retirement, you should know what happens to debts when you die. According to FoxBuisness.com“Nearly 40% of all seniors say they have accumulated debt in their retirement years with no plans to pay it off in their lifetime. Are the heirs and next of kin responsible? There is not an easy answer and it all depends on the situation. The first thing to do in all cases is to notify all creditors of the death. Normally, the estate and the executor who handles the estate will liquidate the assets, pay creditors and distribute the proceeds according to your last will and testament or it will be distributed according to state laws. République démocratique du Congo: "Un regard plein d'espoir!" L'histoire de la république démocratique du Congo (RDC) est-elle vraiment ce futur modèle d'une possible démocratie éthique? La question reste posée, alors que le pays est enferré dans une normalisation de ses fondamentaux, "Finance Offshore", premier site de l'espace francophone international sur la finance offshore s'intéresse au dossier en s'invitant dans le débat politique des actuelles élections.